Brendan Rodgers may suggest otherwise, but things just aren't clicking for Mario Balotelli in England. The Liverpool striker looked off the pace again against QPR on Sunday, missing an open goal and frustrating team-mates with his decision-making in the final third. Balotelli is still yet to hit the back of the net in his second spell in the Premier League following his £16m move from AC Milan, and fans may run out of patience. Putting in the effort for his team is not a characteristic familiar with Balotelli, who often shied away from challenges with opposing centre backs Steven Caulker and Richard Dunne during the win. In fact, the 24-year-old has laid on just one assist in his Premier League career to date - with two years at Manchester City included - while he is experiencing the second longest goal drought of his career (10 league games). 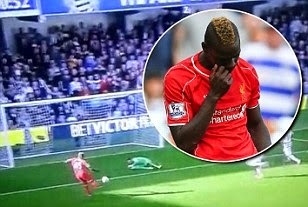 Strikers struggle to hide behind such damning statistics, and Balotelli did anything but that with his second-half miss. Adam Lallana's shot was parried by goalkeeper Alex McCarthy, leaving 'Super Mario' with a simple task from eight yards out. However, the ball ballooned over the bar, much to the amusement of the home fans.